Veteran former WBO Minimumweight World Champion "The Tiger" Merlito Sabillo (27-5-1, 13 KO's) of Bacolod proves that he keeps his passion for boxing on fire as he wages a tough war against Chinese fighter Jing Xiang (14-4-2, 3 KO's) for the vacant WBC Silver Jr. Flyweight Belt this coming Saturday (Sep 15) at Qinzhou Sports Center in Qinzhou City in Southern China. Not lucky in his last clash last February in Bacolod by losing a split decision to unbeaten world-ranked Filipino Edward Heno, Merlito Sabillo now aims at making good use of his experience and ring knowledge to outclass Jing Xiang, 28, an orthodox boxer who has rumbled against seven Pinoy fighters, including Jerwin "Pretty Boy" Ancajas, to whom he lost years ago on points. Will the 34 year-old "Tiger" Merlito Sabillo of the Highland Boxing Gym still have enough danger in his fighting claws to overcome his difficult opponent as his many fans in Bacolod hope? 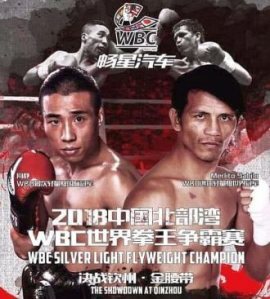 Or will the Chinese warrior be able to hunt down the battle-tested Pinoy Tiger to win the WBC Asia Silver strap? 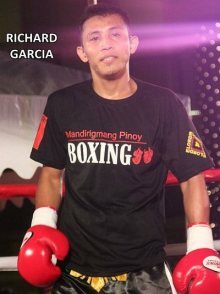 In one of the card's supporting bouts, veteran Filipino gladiator Richard Garcia (27-28-1, 8 KO's) born in Sarangani Province squares off against 20 year-old Chinese rookie Shichao Gao (1-0-1, 0 KO's) in a non-title 8-rounder clash in the super featherweight division. Just looking at the boxers' records, some fight fans might want to bet all their savings that the 34 year-old Richard Garcia should still have more than enough in his weaponry to dominate the younger Chinese newcomer who has battled has a pro boxer only two times in his life. But better don't do bet. Because in boxing we really never know. 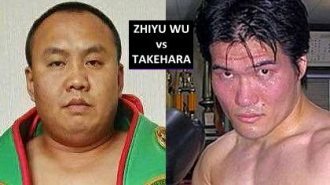 In addition to fights of Filipinos Merlito "Tiger" Sabillo and Richard Garcia against their respective Chinese foes, an exciting well-matched battle for the WBC Asia Heavyweight title should really thrill fans in attendance as rough heavyweights Kotatsu Takehara (15-11, 3 8 KO's) of Nagoya, Japan, and the slightly shorter but really tough Zhiyu Wu (8-2-1, 2 KO's) of China rumble for the coveted green belt; and who will be crowned the new WBC Asian Heavyweight champ? Furthermore, super bantamweight Yutthichai Wannawong (8-6, 7 KO's) of Nakhon Sawan in the Kingdom of Thailand, will climb up the square ring to engage Chinese combatant Jian Wang (6-1, 1 KO). Both 22 year-old orthodox boxers will trade blows in a scheduled 6-rounder non-title clash; and may the Best Man Win.